UPDATE: Congratulations to Rebecca & Ashley H. on winning this giveaway! I hope you enjoy! So, there are few things more satisfying than when a product you loves proves itself worthy of your admiration. So goes St. Ives. Frequenters of Lit&Leisure may remember my very first “Love” post about St. Ives Green Tea face scrub. It was the product that inspired this theme of reoccurring posts for me. I wasn’t going to scrap the brand, in fact I made sure to replace the tube before I would chunk it. But nevertheless, this was an opportunity to show me if they care. St. Ives has a Facebook fan page, so I posted a picture of the failed tube there. 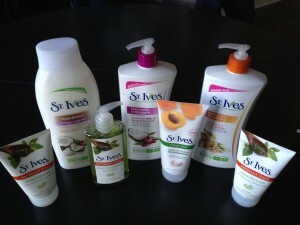 The next day St. Ives commented & gave me contact information for their customer service. Another day later the account rep from their public relations firm contacted me via my blog email, apologized for the bad experience and requested my home address so that she could send me a care package. Saturday it arrived by FedEx. Holy cow! Just in case the picture isn’t big enough, the loot included two bottles of body lotion, a bottle of body wash (a different scent than the one I’m currently using, so I look forward to trying it), a bottle of the Green Tea face wash (a product that I also already use), a tube of their very famous apricot scrub and TWO tubes of the infamous Green Tea face scrub. Somewhat related side tangent: I’ve never been a loyal body lotion user. It falls into the same category as flossing; I know I should do it more often than I do. In the few days since the package arrived, I’ve started using the Oatmeal & Shea Butter Body Lotion & love it. I have dry, itchy skin – especially my legs – in the winter, and this has helped tremendously. It is silky, not too thick & not greasy at all. Back to topic at hand: Since the package included two tubes of the St. Ives Green Tea face scrub, I’m going to give one of them away. 1. Mailing address must be within continental US. 3. One entry for comment on this post. Make sure to leave your email address or email me with it. 4. Additional entry for share on Facebook (use share button below). 5. Additional entry for tweet on Twitter (include @read_babbette or @elisabeth_wang in tweet). 6. If you want to share another way, that’s cool. Just let me know in the comments or by email at readbabbette (at) yahoo (dot) com. The more shares, the greater chances of winning. And, this post would be incomplete without a huge shout out to Kaplow Communications and the St. Ives account rep (Shelia Donohoe) who contacted me. She went beyond letting me deal with the company customer service department. She took ownership of making the client happy, and St. Ives will benefit – they have a fan for life. If you’re a national brand looking for excellent representation, I’d start with Kaplow. Update: Between drafting this post & publishing it, I also received a coupon for a free St. Ives product from their customer service company (with form letter, not nearly as personal as the response from the PR firm), so I’m actually going to give away both tubes of the Green Tea face scrub – so two winners!